Several Rhode Islanders proved successful this weekend on the track oval. Portsmouth's Nikki Merrill clocked the nation's top time in the 1,000-meter run during Saturday's competition at the annual Dartmouth Relays. Merrill finished with a personal best time of 2 minutes, 53.55 seconds. The Patriots' all-stater also ran a leg on her team's victorious distance medley relay that was timed in 12:20.70. 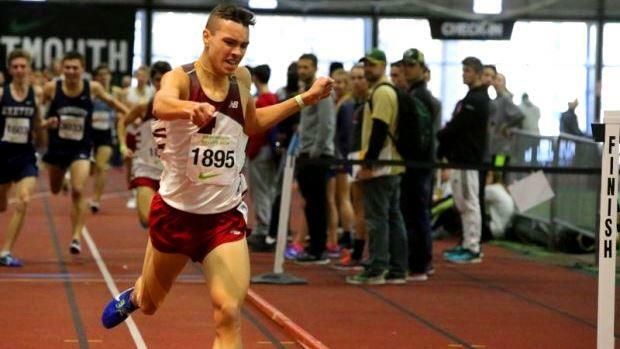 In the boys' mile run, La Salle's Joseph dos Reis earned a berth to next month's New Balance Grand Prix Junior Mile by winning the event at Dartmouth with an indoor best of 4:21.36. That time currently ranks No. 10 in the country. Finishing second overall was Ram teammate Max DiMuccio at 4:23.24. Lincoln's Garrett Doyle led a 1-2-3 sweep for the Lions in the weight throw with a first-place distance of 69 feet, 6.25 inches. Gianna Rao of Ponaganset won the girls' event with a heave of 57-10.5. Toll Gate's Nik Reygadas copped the 800m in 2:00.37. Bishop Hendricken, which won the team trophy with 74 points, captured three relays events - the 4x200m (1:33.87), the 4x800m (8:17.29) and the DMR (10:45.80). At the Ocean Breeze Invitational in New York, Classical sophomore Conor Murphy finished third overall in the 1,000m with a huge PR of 2:32.93. That effort ranks No. 10 in the national and is No. 1 among all sophomores.